Have you heard about collagen powder? 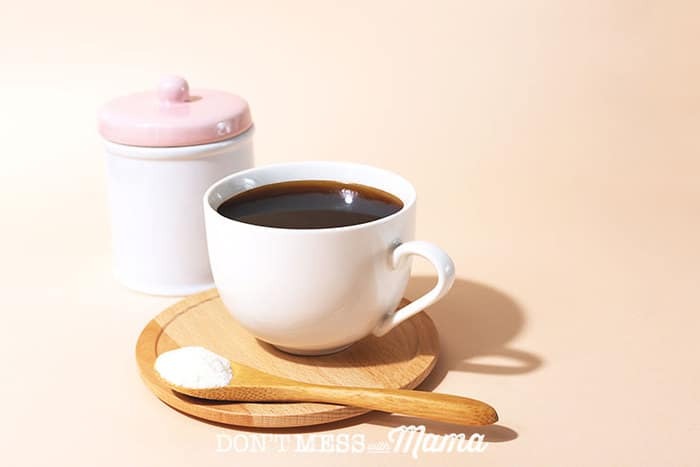 It’s a tasteless and odorless powder that you can add to your favorite beverages, like hot tea or coffee, to get a daily dose of collagen, which is great for wrinkles, cellulite, hair and nails, joint health and digestion. Find out how it works and why you need it. You’ve probably scrolled by an online ad or strolled through the grocery store and found collagen powder. If you aren’t using it yet, you are seriously missing it. It’s an amazing supplement that has a number of health benefits… most importantly for wrinkles and cellulite. What?! You can take a supplement to help with that? Yep! Why the Body Needs Collagen? Collagen is the most common protein in the body, second only to water. When you’re young, your body has higher levels of collagen, so your skin is smooth and firm. Skin cells renew and repair themselves. Joints and bones are well hydrated. Starting in your mid-20s, collagen production starts to dwindle. By the time, you’re 40 years old your body’s collagen production drops by 25% and it keeps going down after that. That’s why your skin wrinkles and creases. But collage affects so much more than skin health… it affects bones, joints, and digestive health. Over time again and these other factors lead to accelerated collagen loss, which leads to wrinkled and thinner skin, as well as joint and digestive issues. It’s a tasteless and odorless powder made from bones, skin and connective tissue (like tendons and ligaments) from animals. Years ago, our ancestors consume more of these types of bones and meat from their diet usually in a bone broth or stew. In fact, bone broth is one of the best sources of collagen. Here’s a recipe on How to Make Bone Broth. But bone broth isn’t always feasible to consume, which is why I love collagen powder. There are many types out there – from a simple grass-fed beef collagen to a multi-collagen powder (I prefer Perfect Collagen) made with different types of collagen, such as beef, fish, chicken bone broth, and eggshell membrane. I really like the multi-collagen powder because it’s made from different types of collagen – type I, II, III, V and X. This is similar to the different types of collagen in our bodies – for instance, type I and III are found mainly in skin, bones and connective tissue (ligaments and tendons) while type II is found in joint cartilage. Now you might have used a skincare product that contained topical collagen. But here’s the thing… the best way for the body to absorb collagen is actually by consuming it, not putting it on your skin. That’s why I personally take collage powder everyday. How to Use Collagen Powder? 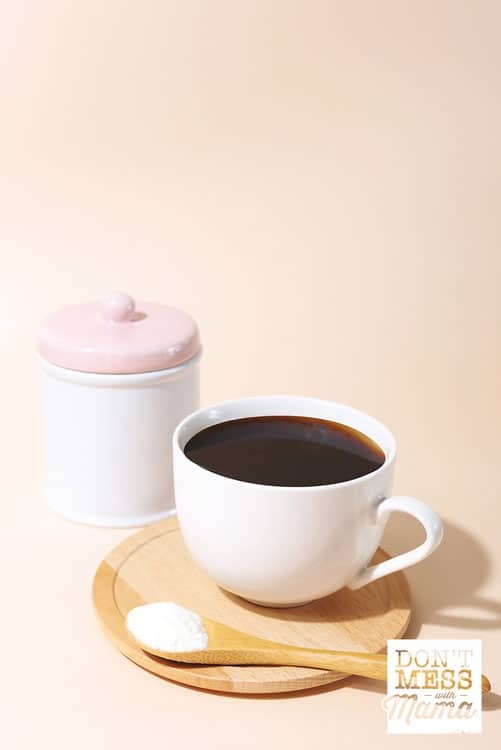 Collagen powder is best absorbed when you mix it in with your favorite hot and cold drinks. I put a scoop (about 1 tbsp) in my hot tea twice a day. It absorbs easily and doesn’t add any flavor or odor to my drink. It can even be added to juices, smoothies, soups, etc. I even added it into oatmeal for the kids to give them an extra dose of collage for the day. Let’s dive a little deeper into the health benefits of collagen powder. Collagen is loaded with vitamins and minerals, such as vitamins C and E, zinc and silicon, which may help prevent and heal stretch marks and wrinkles by restoring skin’s flexibility and making it more capable of handling stretching. One study found that ingesting 50 ml of collagen powder every day for 60 days significantly improved wrinkles. When you start drinking collagen powder, it encourages your body to start making more on its own. So you’ll be turning yourself into a fine-tuned stretch mark fighter, which is great for before or after pregnancy. You’ll also be able to fight wrinkles as you age. Thinning hair got you down? Use collagen powder to keep it thick and prevent it from falling out! One study found that women with thinning hair who supplemented with collagen powder twice a day for 180 days improved their hair volume, scalp coverage, and thickness of hair body after just 90 days. Wouldn’t it be nice not to have to apply hundreds of coats of lotion to your skin this winter? Research shows that collagen powder improves skin elasticity, skin moisture, transepidermal water loss and skin roughness to give your skin a makeover. This means you can use collagen powder to keep your skin moisturized from the inside out in the dry winter months. Don’t hide your legs this summer! Use collagen powder to treat your cellulite. One study found that women who took 2.5 grams of collagen a day for six months significantly reduced their cellulite. If your nails break easily, it might be time to start drinking collagen powder. One study found that women who took 2.5 grams of collagen every day for 24 days saw a significant improvement in their nail strength. They were less likely to break or become brittle, and the women were happier with the overall appearance of their nails. Have you tried collagen powder? Don’t forget to comment below to let me know how it went. You can also FOLLOW ME on Facebook, Instagram and Pinterest to see what other fun things I’m getting up to.